Super Eagles were lucky to have escaped with one point in their match against the Carthage Eagles of Tunisia. Ahead of the match the head coach of Tunisia home based football team, Hatem Missaoui, has declared war on the home based Super Eagles of Nigeria, saying they are different from Niger. The North Africans were obviously the better side in a match in which the home based Eagles looked different from the team that defeated Niger 4 – 1 in their opening game. Quiet unlucky, Tunisia’s goal poacher Akaichi had his goal in the 44th minute wrongly ruled-out by the referee, as the centre man posited that the ball had gone-off the pitch before Hamza’s cross. Chikatara got his fourth goal of the tournament, putting Nigeria ahead in the 53rd minute, before Akaichi who scored twice in their 2 – 2 draw against Guinea deservedly restored parity for the North Africans. It ended, Nigeria 1 – 1 Tunisia. 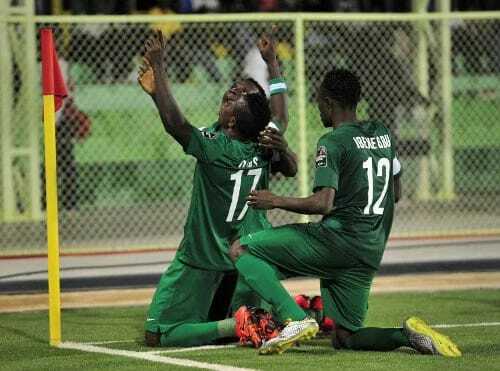 The home based Super Eagles of Nigeria will file out against their Tunisian counterparts at 2.00pm today, as they continue their quest for glory at the ongoing 2016 African Nations Championships (CHAN) in Rwanda.